The dog days of summer are here and in the Carolinas to say the heat has been oppressive is almost an understatement. As we prepare for the start of school it easy to think that summer is coming to a close, but the threat of heat stroke for humans and dogs alike is still very real. 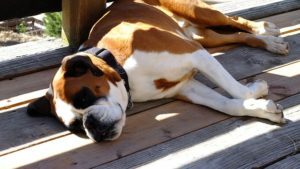 So, how do you know if your dog is suffering from heat stroke? And even more importantly what do you do if it’s happening to your dog. First get your dog out of the heat immediately, but be careful not to over cool your dog too quickly. Lay him on a cool surface, like a tile floor in an air conditioned room. Use cold compresses on their neck, armpits, and groin areas. Get your pet to ANY vet ASAP. Call your vet on the way, but at this moment the closest vet is the best vet. Do not use cold water or ice, over cooling can cause blood vessels to constrict which traps the excess heat in the body’s core and can end up doing more harm than good. Do not force your dog to drink, give him a fresh bowl of water, but do not force it if he is not interested. Do not leave them unattended or let them “sleep it off.” Similar to any other trauma, letting him sleep it off or giving the time to relax alone can be detrimental. He can easily end up worse off in this situation. Fun in the summer is great, but it can also be dangerous. That is why it’s good to know not only the signs of heatstroke, but also what to do in case it happens to you.